It has long been a cause for comment that operatic settings of Shakespeare in the original language have so rarely been successful. There have been a considerable number of honourable attempts at various plays, ranging from Stanford’s Much ado about nothing (once available on an ENS Ensemble audio-cassette) through Holst’s At the Boar’s Head and Vaughan Williams’ Sir John in Love to Humphrey Searle’s Hamlet and Stephen Oliver’s Timon of Athens. I exempt Thomas Adès’s The Tempest from this list since Shakespeare’s text is there substantially re-worded. None have succeeded in establishing a lasting reputation, with one solitary exception. That is Britten’s enchanting comedy A midsummer night’s dream, and it was clearly with the success of that score in mind that Dietrich Fischer-Dieskau attempted to persuade Britten to write a setting of King Lear for him. It is ironic that a nineteenth century proposal by Verdi to undertake such an opera never materialised – like Britten, ill health prevented its consummation. The subject would seem to have been almost designed with Verdi in mind. The Italian composer had probably first encountered the subject during one of his visits to London, at a time when Nahum Tate’s bowdlerised edition of the text - giving the work a happy ending - was giving way to the revival of Shakespeare’s original. To do some justice to Tate, his version was actually reverting to the original pseudo-history as reported by Holinshed which had formed the basis for Shakespeare’s play. Also, at that time it was customary to tone down the tragic endings of these works — as can be seen in the original version of Ambroise Thomas’s Hamlet. It is perhaps too easy to sneer at the dictates of fashion at a time when Shakespeare’s texts were far from being regarded with the semi-religious respect we accord them now. Be that as it may, Fischer-Dieskau then turned to the German composer Aribert Reimann to provide the opera with the title role which he so fervently desired. The results, premièred some two years after Britten’s death, achieved considerable success. This was partly the result of excellent casting – not only Fischer-Dieskau himself in the title role, but such other major singers as Julia Varady and Helga Dernesch as two of his daughters. The production was by Jean-Pierre Ponnelle, at that time one of the major European directors of opera. The first production was captured off the stage in a sumptuously produced DG recording on LP (now transferred to CD). The opera was given in English translation in London and New York, albeit without Fischer-Dieskau as the demented monarch. Reimann had an excellent reputation as a composer of opera – he had also worked with Fischer-Dieskau as an accompanist – but his later works for the stage, such as The ghost sonata which I reviewed a couple of years back, failed to establish themselves to anything like the same degree as Lear had done. His highly expressionist style of writing fitted well with the rampaging drama of Shakespeare. He also had the ability to achieve a real sense of stillness and emotional engagement in such scenes as the death of Cordelia. There was also quite a lot of sheer violence – as in the blinding of Gloucester – which seemed to show relish for the sense of alienation for its own sake, and the vocal writing was sometimes ungrateful and hectoring. I would imagine that the original Munich production would have been televised, but if so no recording seems to have appeared on video. If it has, it has never been more than intermittently available. Judging by Andrew Porter’s description of it when it transferred to San Francisco a year after its première, it seems to have been a thoroughly dispiriting affair. A unit set was employed throughout — although Reimann had provided orchestral interludes to cover scene changes — and Ponnelle’s production ideas seem to have been pretty thin on the ground. This new version, coming some forty years later, updates the action to modern times. Although this can be a risky procedure if it leads to anachronisms which reduce the plot to inanity, it works fine for a work like King Lear. Holinshed set the legendary reign of Lear in pre-Roman times; but, apart from the name Lear itself — presumably derived from the mythological Irish king Lír with his unfortunate children — Shakespeare makes not the slightest attempt to portray any Celtic elements in his treatment of the period. Indeed, some of the names he gives to his characters – Edmund, Edgar, the miscellaneous earls and the anonymous King of France – are at least a thousand years adrift from any supposed historical context. The basic plot of Lear – a leader resigning to make way for a preferred successor, only to find himself fundamentally disagreeing with the way that the successor behaves, remains a very contemporary one. Wiser modern leaders keep their vitriol to themselves, only releasing it when they write their memoirs; but there are also plenty of examples in recent history of displaced rulers complaining bitterly and publicly about the treacherous behaviour of their anointed heirs in the best Lear tradition. Moreover, with this first outing for the work on video for home viewing, it has to be observed that the more uncompromising elements in the score make a much more favourable impression when seen as well as heard. What seemed merely cacophonous in the sound recording makes more sense as part of a dramatic experience. The action has, not improbably, been transferred to the modern era, with the initial scene where Lear divides his kingdom taking the form of a board meeting with all the interested parties. Advantage is also taken of Reimann’s provision of orchestral interludes — not that interesting in themselves, alas — to make changes of scene as appropriate. Since these are largely effected by a stage revolve, the interludes are too long for their purpose, and much is therefore thrown back on the protagonists who have to interact with each other during the music. They do this capably, but at one point – immediately following on Lear’s mad scene – the cameras are forced to cut away to the orchestra pit and show us Reimann’s use of a real bass flute - not the alto flute in G commonly named as a ‘bass flute’. This is of interest to the technically interested but does dissipate the dramatic impetus that has been built up. The singing is generally well able to stand comparison with the original stellar Munich cast. In the title role Bo Skovhus has the same lieder-singer’s concern for words that distinguished Fischer-Dieskau, and he is if anything more careful in his delineation of the coloratura that erupts as the King descends into madness. He may not have the sense of sheer presence that presumably Fischer-Dieskau brought to the part, but the results, even in the most strenuous sections of the score, are never less than musical. Even more extraordinary is the achievement of Andrew Watts in a role originally written for the peculiarly specialised voice of David Knutson, with a light tenor extending high into the counter-tenor regions. If anything Watts surpasses Knutson in the manner in which he blends the registers in an almost seamless manner. As the three daughters, Katja Pieweck as Goneril and Hellen Kwon as Regan are both monstrous creations in their carefully distinguished ways; they make a powerful impression in their duet in Scene Two. Siobhan Stagg is a properly concerned Cordelia, more than just a helpless pawn in the action. One might perhaps have welcomed more solidly bass resonance from Lauri Vasar as Gloucester but among the principal singers the only weak link is Erwin Leder as the Fool. His elderly and frail voice is insufficiently projected to bear the weight of the role that is thrust upon him and his facial expressions lack any sense of compassion. In the more minor roles, the heldentenor strength of Martin Homrich as Edmund stands out. Simone Young clearly believes in the score, and elicits powerful and responsive playing from the Hamburg orchestra. The chorus do not have much to do, but do the best they can with what they are given. Lear is never going to be a loveable opera; the performance is received at the end with generally polite rather than rapturous applause. I even thought I detected some isolated boos for the composer as he came on stage to congratulate the cast. Nonetheless with the assistance of video the work makes a stronger impression than in terms of audio alone. The camera direction is sometimes haphazard – during Lear’s mad scene it drifts off towards the wings for no very apparent reason – and some individual points in the production are mystifying — why does Lear gather piles of boots during the mad scene, only to drop them again? — but these are not seriously distracting. Rather odder is the Lady Macbeth-like gesture of revulsion which Regan manifests following the blinding of Gloucester. This seems seriously at odds with both the music and her subsequent remark “Let him crawl his way to Dover”, which hardly suggests any pangs of conscience. A four-page essay in the booklet by Kerstin Schössler-Bach gives us considerable background to the opera, but explains less about the producer’s concept of the score. This might have been helpful, as indeed might have been a supplementary documentary on the matter; there are no extras at all on the DVD. One point: this is not, as both the box and booklet claim, a “world première recording” even if it may be the first on commercial video. Quite apart from the original DG issue, there has even been a second outing for the opera on CD, released in 2009, which was favourably reviewed for this site by Glyn Pursglove although he regarded it as a second runner to the DG set. That said, for reasons I have explained, the opera makes more sense when treated as a dramatic experience with the visual element before the listener’s eyes. We are also provided with subtitles, whereas the later Oehms release lacked a translation of the German text — not at all points faithful to Shakespeare. Perhaps unusually for a German stage production, all the recordings present the score without cuts although Albrecht on DG despatches it in 143 minutes as against 156 here. 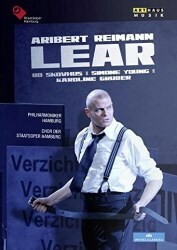 Although Albrecht’s cast sets a standard for excellence, I have no hesitation in stating that for those unfamiliar with the score of Lear – or even for those that are – the increased sense of involvement in this performance either on DVD or Blu-Ray should make it the first point of engagement for those interested in later twentieth century opera.